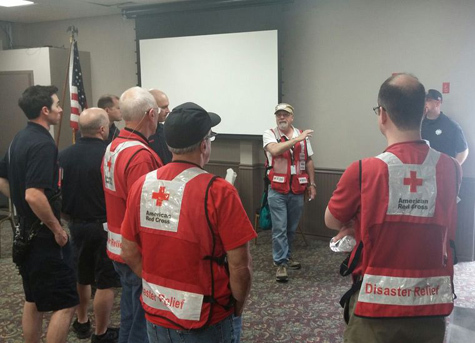 About 50 volunteers were "making neighborhoods safer" April 23 by checking and installing smoke alarms, reviewing home fire escape planning, stressing the need for renters insurance and reviewing a home fire safety checklist as part of the American Red Cross Home Fire Campaign. Seventy-five smoke alarms were installed in three neighborhoods through the program, which partnered the Red Cross with the City of Wildwood and its fire and police departments, Boy Scout Troop 78 and members of the high school National Honor Society. More than 460 homes were visited. 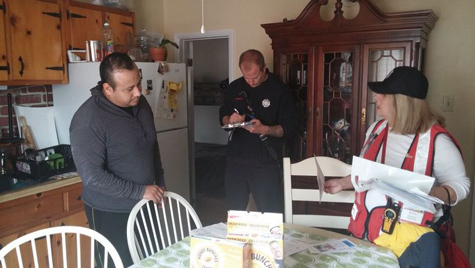 "We are pleased to have been able to install 75 free smoke alarms and canvass hundreds of homes with fire safety information," Erica Viviani, Red Cross communications manager, said. She noted that the number of smoke alarm installations can vary depending on the number of people at home when the teams visit and how many homes already have functioning smoke alarms. "Wildwood was chosen because the number of fire-related injuries and deaths from 2007-2012 put it in the Top 20 zip codes across New Jersey," Viviani said, explaining the National Fire Incident Reporting System data used by the Red Cross to target areas with the Home Fire Campaign. During that time, she said there were 19 fire-related injuries or deaths. Since April 2014, she added that the Red Cross has helped six Wildwood families for fire-related events. "When you consider the City of Wildwood is only 1.2 square miles, that is a high number," said Deputy Fire Chief Daniel Speigel. He noted the department handles 3,500-3,600 fire and emergency services calls a year, about an equal number during the busy summer and off-season months. The department also conducts fire inspections and rescue operations, and coordinates the city's Office of Emergency Management. "We are also going to target some of the buildings that have suffered damage from Hurricane Sandy and Jonas (winter snowstorm which caused extensive flooding)," Speigel said about the Home Fire Campaign. "We want to be sure that homes have smoke alarms." "It's important for us to do this program," noted Mayor Ernie Troiano Jr., as he welcomed volunteers and thanked them for what they were about to do. "Wildwood has an impoverished community and some people don't even have smoke detectors. "I'm a battalion chief (in the fire department) and I don't have smoke detectors in my own house," he admitted to the group of volunteers. "You never think it'll happen to you." Carol Cohen, executive director, South Jersey Chapter Red Cross, said the Home Fire Campaign, launched last year, is a "monumental effort whose goal it is to reduce fire-related deaths and injuries by 25 percent by 2020. We want to make neighborhoods safer." As of April 2016, Red Cross and its community partners have canvassed thousands of homes and installed more than 10,000 smoke alarms in high fire-risk areas throughout New Jersey. “Smoke alarms can cut the risk of death from a home fire in half,” added Kristee Lauro, disaster program manager, American Red Cross New Jersey Region. "The Red Cross is urging everyone to take two simple steps that can save lives: check their existing smoke alarms and practice fire drills at home.